(0 Customer Reviews) | Write Review 4 issues per year Our Aim is to help you and your family create lifetime memories. With the widest readership of any publication in its genre, Holidays with Kids is firmly established as the go-to magazine for family travel. The publication has over seventeen years’ experience providing the latest news, developments and inspiration on family travel at home and abroad. Each issue brings readers 196 pages of information designed to meet the needs of all families and create confidence in travelling with children. Its appeals to everyone, whether travelling on a budget or an extended luxurious getaway. Holidays with Kids takes readers on a journey through the best the world has to offer, without losing sight of those important logistical factors that families must consider. Covering issues ranging from children’s safety through to family entertainment, we also provide the full spectrum of accommodation styles, from camping and farm stays to luxurious resorts. 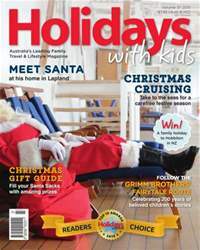 Welcome to the spring edition of Holidays with Kids packed with 178 pages of terrific family holiday ideas. 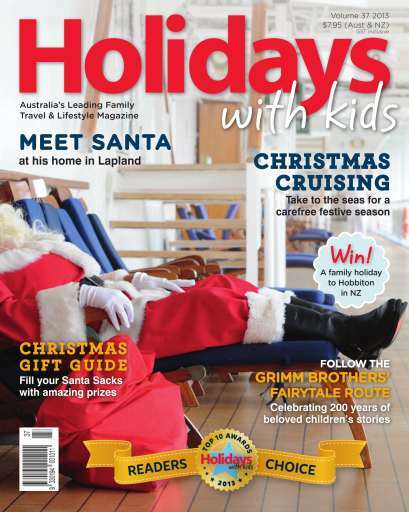 This issue we reveal the reader’s choice winners from our Top 10 Family Resort Awards, and we’re also gearing up for the silly season with the best Christmas cruises, the inside scoop on meeting Santa in Lapland and a huge Santa’s-sack worth of goodies to giveaway. We also bring you the latest family news from Australia’s theme parks, venture into summertime snowfields and Australia’s rainforests, and fall in love all over again with NSW’s East Coast and Ballarat. Further afield we take you on magical adventures to Middle Earth (a.k.a. New Zealand) and the Grimm Brothers’ Germany, and laze back in Fiji, Hawaii and the Philippines. To top it off, our Caravan and Camping section brings you beachside camping spots, an awesome 4WD road trip idea, fantastic holiday park info and a whole lot more. Our Aim is to help you and your family create lifetime memories. You'll receive 4 issues during a 1 year Holidays With Kids magazine subscription. You'll receive 4 issues during a 1 year Holidays With Kids magazine print subscription.